The following reflection is featured in the full prospectus for WAWADIA, released Nov 1 in support of the IGG campaign to help fund publication. In the eventual book, this piece will help to set the historical stage for the current flood of change and innovation sweeping through the world of modern postural yoga. Notes and citations are are the end. I welcome all feedback. [dropcap]O[/dropcap]n August 14th, 2014, the news flashed through the yoga world that Mr. Iyengar had been admitted to a private hospital in Pune following a three-week illness. He was accompanied by daughter Geeta, son Prashant, and their family physician. His blood pressure, regulated by decades of equanimity in standing postures, was dangerously low. His breathing, famous for demonstrations of control and retention, whistled shallow in his barrel chest. The doctors placed him on a ventilator for the first day, but he insisted it be removed. His heart, which had thumped faithfully through countless backbends, was feeble. His feet, which had stepped on the backs of devotees prostrated in child’s pose, which students gazed at for hours as he instructed the subtleties of ball-mound rooting and inner-arch-lifting, and which, in later years, devotees touched to show their respect, were now swollen with deoxygenated blood and pooling lymph. By August 18th, the man who had introduced the principles of “kidney breathing” to the world of postural yoga was placed on dialysis, as his kidneys began to fail. On the 19th, doctors administered a nasogastral feeding tube. Reports of his earlier refusal to be hospitalized expanded, suggesting that most if not all of these interventions would have been unwelcome. The man who had enthusiastically worked to open dialogue between yoga and biomedicine was now firmly in the clinical grasp of the latter. It would seem that a precious goal of the experiential yogi—to be able to feel the approach of death unmediated and in solitude—was now lost to him. In his last hours, his lifelong passion for self-observation—for carefully monitoring the qualities of every twitch and pulse for the signs of grace or its absence—was occluded by the clinical gaze. If he’d been able to continue to listen to his heart, its faltering thump would have been drowned out by the heart monitor that amplified it. On August 20th at 3:15 am local time, Bellur Krishnamachar Sundararaja Iyengar died. On social media, some refused to use the word “death”— insisting on “mahasamadhi”, which describes the ultimate absorption of a meditator. [dropcap]G[/dropcap]lowing tributes flooded the web, hailing the “Lion of Pune”, the supreme innovator, inspiration of millions. Hundreds described how Light on Yoga appeared in their lives at critical junctures, and changed their paths. They posted photos of their broken-spined copies, scribbled on on every page, held together by rubber bands. Senior students issued somber and tender memorials. I took it this way: Iyengar’s yoga seems to recall a child’s dream of perfect order and uniformity. As if a body—a woman’s body especially—unfolded its potential by being folded just so. As if a teacher is meant to provide a template in absolute symmetry with his idea of virtue, if not with the curves of the world. But there was also a touch of melancholy in the Lego image, glinting out through its sepia Instagram filter. It seemed to say: Yoga has made children of us, in good ways and painful ways. Maybe we recaptured a sense of play and wonderment. Maybe we regressed into depending upon a new parental energy. Now that he is gone, we must grow up, and put away our toys. The best mourning is complex, avoiding mystification and hagiography. [dropcap]T[/dropcap]he Iyengar family brought the patriarch’s body home, dressed it in ivory silks for the cremation rites, and laid it out on a simple bamboo mat. They draped it with garlands of flowers. I imagine they felt the silent questions of every mourner: Where did his movement go? Where is the prana he sculpted and nourished for seventy years? Where is the cellular intelligence he spoke of now? Does it just fall silent? Is it in the air around him? Has it become part of us? Those more remote are left to wonder what this death, for all of its preparation, felt like. Was it different from any other death? Did his obsession with breathing yield some final flash of insight or consolation as it collapsed? Did he feel the skittish rise of udana vāyu dart through his spine with his last exhales? Was that sensation obstructed by the feeding tube? Did radiance slowly fill the space left by his retreating senses and mind? What did his yoga do for him in the end? No one can know. Iyengar’s body in death is as enigmatic as it was in life, as silent and strange as the millions of photographs he leaves behind. The most demonstrative yogi in modern history used this body to form shapes purported to be windows to a brighter internal reality. His brash display both allied him with a revisioned Hatha heritage and alienated him from the philosophical bent of other streams of yoga evangelism, like those initiated by Vivekananda and Aurobindo. With every extension, flexion, and rotation, he insisted that the material perfection of a form—or the actions towards a form, however subtle—was sacramental. To a rapidly disembodying world, he offered forms of the body in attitudes of sombre praise. Students the world over learned and mimicked those forms, and many now testify to transformation and healing. But their reports are marked by equal amounts of pleasure and suffering. We can never grasp the internality of another person—even less, perhaps, one upon whom we project our wishes. We have the artifacts of Iyengar’s flesh: his words on paper, his bombast on scratchy video, his fading echo in the spines, hips and shoulders of the thousands who studied with him in person. But no one can say for sure, without quoting Iyengar’s grand self-reporting, how his yoga felt for him. No one knows the ratio of bliss to pain in his body, how he managed the anxiety of that youthful dream he confided to Victor, and what dissatisfactions drove him to demand so much of his students. We cannot ask him: Was it worth it? Had his life-long experimentalism not collided with the ancient rites of his family, Iyengar may well have donated this vacated body to science. No one would have been more interested in his autopsy than him. Was his marrow transformed by a lifetime of practice? Did he avoid the brain-tissue calcifications of other men his age? Did his arterial system remain plucky and plaque-free till the end? Were his lungs really as enormous as they seemed from the outside? Did he have the world’s largest diaphragm? But there can be no autopsy of the guru. We cannot dissect him, for this would reduce his body to the same substance as our own. We cannot find his myth within his corpse, for either it is departed, or we realize it was only ever in ourselves. The Iyengar family is both abiding tradition and protecting his devotees when they scramble to cremate him at the earliest possible time. Early on in the research for this book, I tried to parse one of Patabhi Jois’ more provocative aphorisms in an article online. One slightly chafed reader suggested that I pick on Mr. Iyengar’s words instead, because he was “still alive to set me straight.” She was pointing out something I’d long felt in my own practice—that if I were ever to make it to Pune, all of the niggling questions about technique that his senior students seemed to disagree on would be resolved. I could ask him exactly what he meant by this instruction or that, as though it would help me understand my body or my life better. Well, he can’t clarify anything now. Soon enough, we will have to stop asking what he meant, forced to turn to our peers for less certain answers. Arguments and insights into the great man’s methods, dictates, gregariousness, warmth and tantrums will dissolve as his living memory dissipates. [dropcap]T[/dropcap]he giants of the modernist age of yogic entrepreneurial globalization are now all departed, debilitated, or disgraced. Sivananda is gone, along with most of his disciples. Kripalvananda, who taught asana as the dance-like expression of spontaneous bliss, is gone. Muktananda and Swami Rama are gone, their magic and abuses leaving a trail of the ecstatic wounded. Yogi Bhajan is gone, leaving his aphorisms blurring on millions of wet Yogi Tea teabag tags. Pattabhi Jois is gone. T.K.V. Desikachar, one of the last living links to the grandfather of modern postural yoga, T. Krishnamacharya, is reportedly suffering from dementia, and has been hidden away by his family, ostensibly to save face. In a completely different and ignominious fall, Bikram Choudhury is now facing charges of having raped several students. With the exception of Jois (through this grandson Sharath), none of these evangelists has left a successor of note, and those who have presumed to succeed them—Amrit Desai, John Friend, and Kausthub Desikachar, among others—have all been quickly cut down to size, on the surface by their own ethical failings, but on a deeper level by a more skeptical culture that is less tolerant of idols, and more seduced by irony than it is by charisma. The death of Iyengar marks another step towards the growing democratization of the yoga world—perhaps not in terms of who has commercial clout, but certainly in terms of who holds authority. When no one is left to tell us exactly what to do, can we finally say we are adults? The death of a great man also erodes the Great Man Story, leaving space through which more hidden stories may emerge. I’m thinking of Vanda Scaravelli, ten years Iyengar’s senior, one of his few female students who didn’t seem intimidated by him, who would punch him playfully in the belly and tease him about his weight. She went on to teach a small cache of students, one at a time, who have all gone on to influence yoga for decades without grandiose institutes, certification programmes, or even websites. Scaravelli died in 1999 in Florence, where she lived and taught for over thirty years. I’m also thinking of Dr. Karandikar. He was Iyengar’s personal physician until he was reportedly worn down by the teacher’s constant stream of verbal abuse. Karandikar left the Ramamami Iyengar Memorial Institute to found Kabir Baug Sanstha just three kilometres away, across Pune’s Mutha river. Kabir Baug is a sprawling yoga therapy clinic and therapeutic college that serves thousands of mostly Indian clients and students every year. While Iyengar globally advanced the hypothesis of “yoga as therapy”, Karandikar seems to have quietly proven it by staying at home and using a seamless blend of ancient and modern techniques. Most injured clients who come to Kabir Baug for asana instruction receive a spinal x-ray before they even begin. This clinic is unknown to the global yoga community, I think, because Karandikar’s skill is not occluded by the projection of intuitive wizardry, but rather demystified through the medical technologies that have almost replaced divine vision. Karandikar has flown below the radar of Western fetish and orientalism, perhaps because his work is to show us that embodied insight is not the domain of a charmed few, but is democratically available to everyone. It is of a white-haired man, walking through clouds towards a simple gate. His leonine bearing is disrupted by his worried mood. Perhaps he wonders if he is standing tall enough, breathing deeply enough, if he is pliant enough in his spine to adequately bow to his forbears, his austere guru, and the earth itself. He puzzles over which asana to assume to ask forgiveness from those he burned with his zeal. He frets over whether he is finally fit to honour the thrilling and awful gift of being a body. Epigram: http://www.youtube.com/ watch?v=4t2OLXi2xvY&feature=youtu.be, time cue 5:08. On August 14th, 2014 . . . Source: http://timesofindia.indiatimes.com/city/pune/Yoga-guru-in-hospital-stable/articleshow/40218765.cms. Other details come from the 8/13 edition of Indian Express: http://indianexpress.com/article/cities/pune/ yogacharya-b-k-s-iyengar-admitted-to-hospital/. On August 20th at 3:15 am local time: Source: http://timesofindia.indiatimes.com/india/ Yoga-guru-BKS-Iyengar-passes-away/articleshow/40462779.cms. Amongst my several thousand yoga contacts on Facebook. . . Denise Benitez, Facebook status update from 8/19/2014, 7 pm PST: BKS Iyengar, the great progenitor of yoga in the West, has died at the age of 96. As one of the minions who trained in and taught Iyengar yoga in the 70’s and 80’s, I am grateful to him for his keen eye and passion for precision and order. I learned so much from Iyengar teachers, and all of it changed my body and my life for the better. Probably none of us would be doing yoga without his influence, or at least not the way we do yoga now. I am immensely grateful for his presence on the planet. And yet, my “relationship” with him was complex. I never met him personally, but I saw him in action at Iyengar conferences, and he humiliated, shamed and bullied his students and teachers, mostly women. He was highly patriarchal and was an old school “guru” who expected his word to be obeyed without question. In the 80’s, one of his senior male teachers was inappropriately touching women in classes. I was one of those women. When this was told to Iyengar, he said that all of the women who had reported this were lying. So on the occasion of his death, I am left with an unsettling mix of emotions — the passing of an era, the jewel of yoga that he brought forward, his narcissism and ferocity, the fact that he had been homeless, sickly and lost as a boy, and that yoga saved him, as it has saved so many of us. All I can do is wish his spirit well, with all my heart. May his soul rest at ease. Those more remote are left to wonder . . . Udana vāyu is the upward-moving “wind” of yogic physiology, said to be the material mechanism by which the atman is ejected from the flesh at death. The radiance of death is common trope in Tantric literature. Most famously elucidated in The Tibetan Book of the Dead, popularized by Sogyal Rinpoche in the 1990s. No one can know . . . Both Swami Vivekananda and Sri Aurobindo were antagonistic, to differing degrees, to the physical heritage of Hatha yoga. “Sacramental”: In my early Catholic education, a sacrament was defined as “an outward sign of an inward grace.” This formulation goes back to St. Augustine’s early catechism, later formalized at the Council of Trent in the mid 16th century. With the exception of Jois . . . Note: many conversations with “older shala” students of Jois from the 70s and 80s, reveal the common opinion that Sharath does not command the same grandeur as his grandfather, who many considered to be a shaktipat guru. The death of a “great man” . . . About Vanda joshing Iyengar: this anecdote comes from Sandra Sabatini via interview. I’m also thinking of Dr. Karandikar . . . This report comes from an interview with David McAmmond, one of the few Western students to study extensively at Kabir Baug Sanstha: http://www.kabirbaug.com/. Within twelve hours of his death . . . http://www.rediff.com/news/slide-show/slide-show-1-bks-iyengar-cremated-amid-vedic-chants/20140820.htm. Thank you for this article, Matthew. I sure it’s been viewed by thousands of yogis around the world. You write cogently, clearly and compassionately, not an easy combination, but your signature style. I look forward to reading your book, WAWADiA and support your campaign to raise funds for the writing of it. Here is a blog I wrote on my relationship with Mr. Iyengar. I wanted to share this with you because of the humanness of my connection with him. It has taken me time to process Mr. Iyengar’s death and my relationship with him. I first met Mr. Iyengar in 1977 when I travelled to India to study Yoga at the tender age of 36. My Yoga teacher, at the time, told me that Mr. Iyengar would ‘fix’ me. I didn’t know what that meant, and it scared me, but Mr. Iyengar was a teacher and without students he couldn’t teach and so, I reasoned, I was as important in the process as he was. When I first saw Mr. Iyengar he was teaching Yoga in Bombay (Mumbai) at the top of many flights of rickety stairs. Needless to say I was afraid to meet him and especially since I heard that he hit his students. I had secretly decided that if he hit me, I would hit him back. But when I first caught sight of him, he looked and reminded me of my Italian uncles—short, blustery, loud, with a sense of humour and a sincere heart. I liked him instantly. And, he liked me. He would (affectionately) bat me on the side of my head with, “This one, she understands.” I would nod, knowingly, even though later I didn’t know what it was that I understood. He even elevated me to a more advanced level in the class and he never hit me, although, I did see him whack other people, as he said, to wake them up in their bodies. I still told myself that if he hit me, I would hit him back. I wasn’t afraid of him. I did worry about him, though, because I was there to celebrate his 60th birthday and with so much adulation coming his way, I noticed that he believed what people were saying. I worried about that. On the other hand, I got that he was helping people. I saw them get stronger in their bodies, as I did, in the three short weeks I was there. And, when it came time to leave, I promised him I would come back to study with him again. I never did return but we did exchange letters back and forth. He was my guide. I built a beautiful Yoga studio beside my home, as had done. And, I taught Yoga with the same spirit of wanting to help people, as he had helped me. But studying with other teachers I found a depth to Yoga that introduced me to the wounds in my emotional body and I learned how to connect with them and dissolve them. This put me in touch with my shadow side and how it played out in my life. I felt more whole, connected and alive. When, in a letter, I explained this to Mr. Iyengar, he wrote back to admonish me but it was too late. I had already discovered the finer sensations of a more graceful body and I couldn’t return to bulking up my muscles and lose this connection to my inner self. But Mr. Iyengar remained in my body and in my heart, as it was his teachings that laid the foundation for my Yoga practice. And, I wished that one day I could share what I had learned with him. Deep inside myself I felt I would. After I heard he died what I learned from him came more alive in my body. Certain muscles in my legs began to wake up (I almost felt him whacking them!) and both legs became more the same. Even though he was gone, I felt him with me and knew that one day we would meet again, as we had done many years ago, and once again, we would recognize each other as friends. Looking for something? Visit the archive for a tidy list of all my articles. 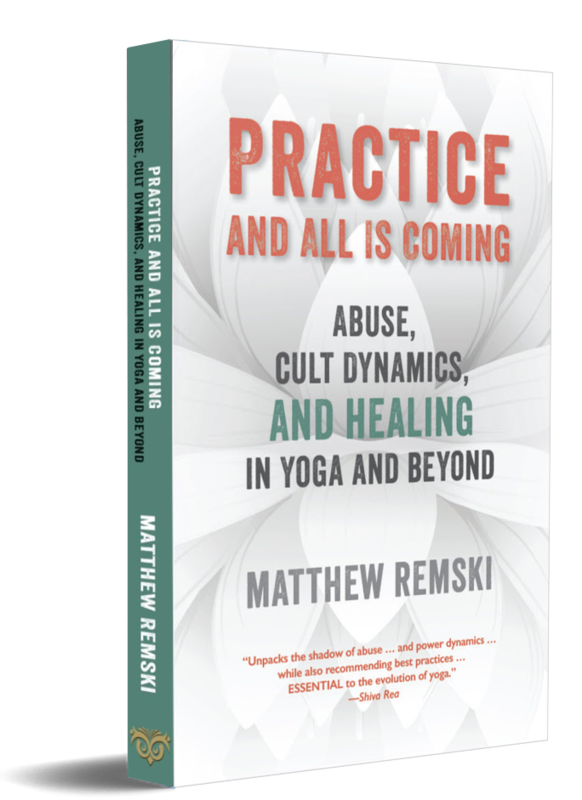 Matthew Remski writes and presents on yoga and ayurveda in the shadows of capitalism and climate change. He is the author of eight books of poetry, fiction, and non-fiction including Threads of Yoga: A Remix of Patanjali’s Sutras. Copyright © 2018 Matthew Remski. All Rights Reserved.